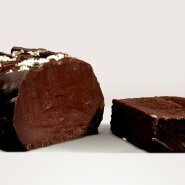 This rich velvety chocolate fudge has an intense chocolate flavour with a salty edge which makes it dangerously moreish. It tastes as smooth and rich as a chocolate fudge cake. Handmade with fresh whipping cream and dark chocolate. All natural ingredients and no preservatives. Sugar, CREAM, Water, Dark Chocolate [(Cocoa Mass, Sugar, Fat- Reduced Cocoa Powder, Emulsifier: SOYA, Cocoa Solids 54% Min)] (6%), Glucose Syrup, Inverted Sugar, Cocoa Powder (5%), Dextrose, Sea Salt (1%). Decorated with Sea Salt. 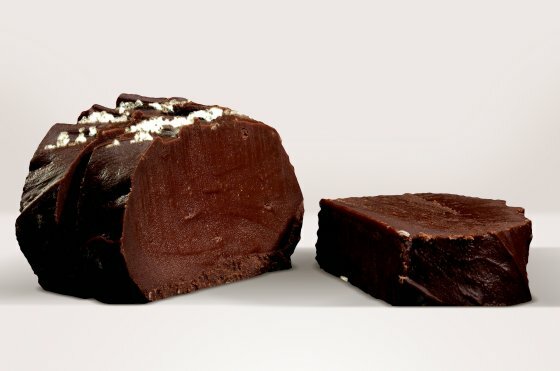 Wow, the best fudge ever! I love dark chocolate so cannot see it lasting too long. The definite favourite in the gift box. Family wars were waged over this! Beautiful, delicious fudge, as always! First come across your fudge at Christmas Ideal Home, and now I have to treat myself to a delivery every few months!! Great work everybody, thankyou very much! Another favourite. Rich chocolate with the same silky smooth texture as the vanilla. We love it! Definitely our favourite! All flavours I purchased are absolutely delicious and we will definitely be buying more in the future! Delicious fudge, really smooth and gooey. Came neatly packaged in a box. Five orders as of this date should be sufficient positive feedback. Probably one of my favourites! Could eat the whole bar in one sitting it’s that great.